Marketing and Sales – Can a Person Do Both the Jobs? 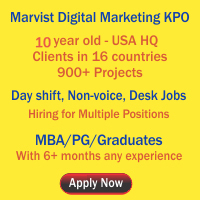 In India Marketing is one of the commonly misunderstood job prospects. Assuming marketing as sales (selling products/insurance policies) most people believe that a person can handle both the jobs with the same set of skills. But, in fact marketing and sales are two different concepts. Though they share a common objective of increasing revenues, they play discrete functions and thus require distinct skills to be pursued to do the jobs effectively. Moreover, the roles and responsibilities of each position are so specialized that same person in most situations cannot handle both the jobs. In this article, let us see the key difference between a marketing job and a sales job and also the kind of skills required to perform these jobs efficiently. Sales target individuals or small groups for immediate goals. Marketing, on the other hand, targets a larger group and typically has long term goals. While the typical goal of marketing is to generate interest in the public towards the product and to create leads, sales focuses more on converting prospects to actual paying customers. Marketing involves a series of activities such as consumer research (identifying the needs of the customers), product development (designing innovative products to meet existing or latent consumer needs), advertising the products to raise awareness, building the brand, etc., whereas, sales involves directly interacting with the prospects and persuading them to purchase the product. Further, marketing concentrates more on retaining trust and loyalty of the customer and providing value and usefulness through the life of owning the product. On the other hand sales activities are confined until the sale is done. Marketing emphasizes on requirements of the target market and plans to meet the customer demands. It first determines customers’ needs and wants and then decides how to deliver a product to satisfy those necessities. Marketing views business as a customer satisfying process. Contrary to marketing, customer orientation in sales is to make the customers’ demand match the products that the company offers. From its point of view business is converting inventory of finished goods into cash. Marketing is a broader and wider concept. It is not just confined to selling or advertising products. The main aim of marketing is to fulfill customers’ wants and needs by providing them with the kind of products they are looking for. Marketing efforts will be in such a way that the customer genuinely gets interested in buying the product. It is a long run process which continues even after selling the product to ensure customer satisfaction. The ultimate objective of marketing is to make the customer loyal to the brand. On the other hand, sales is a narrow concept which is confined to selling the products and reaching the assigned sales targets. It is usually a one to one process. Once the product has been developed or a lead has been generated, sales personnel need to turn the lead into a customer by persuading him to purchase the product. Skill set – Do marketing people need same skills as sales people and vice versa? Going back to our main discussion – in both the jobs, goals are different, activities are distinct, customer orientation is different, the way they look at the business is different and above all the concepts themselves are different. Then, how can a person use his sales skills to do a marketing job and vice versa? Compared to sales marketing is a complicated, yet interesting process. To develop a winning marketing strategy, the marketing team requires a mix of abilities like creativity, conceptual and analytical skills, co-ordination, research skills, decision making. Whereas, in sales persuasion plays a vital role. The ability to communicate company’s prospects in a clear and concise way that persuades prospective customer to buy the product is highly essential. So, we can simply conclude by saying that as two jobs are of distinct nature, skills needed to perform them are also different. In addition, the outlook of a person who needs to do sales should be very different than one who is doing marketing. Due to both the breadth and longer duration of the goals, there will be conflict that may force sales person or marketing person to prioritize sales over marketing or marketing over sales. If you think this article is helpful, please share it with your friends! This entry was posted on Jul 2012 at 3:29 PM	and is filed under Marketing Jobs in Hyderabad > MBA Marketing Jobs > SEO Jobs. You can follow any responses to this entry through the RSS 2.0 feed. Your Feedback Matters!